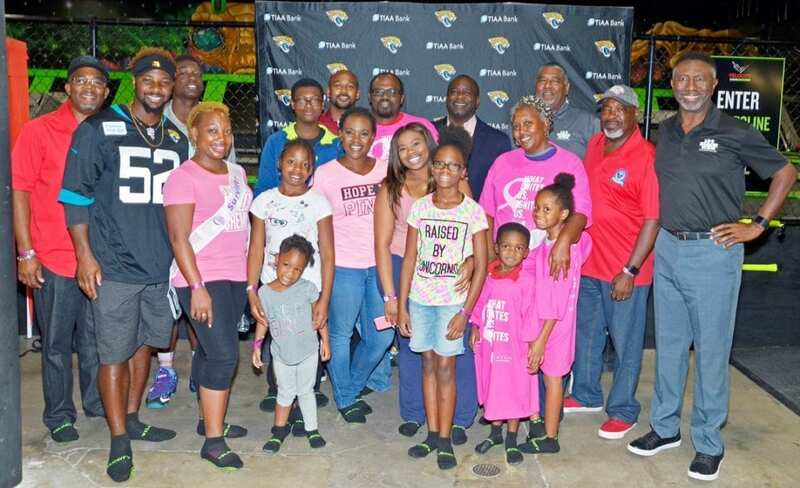 100 Black Men of Jax, Jaguars make “Crucial Catch” for Cancer Survivors – 100 Black Men of America, Inc.
Jacksonville, FL – The J100 partnered with Jaguars Foundation and Jaguars players to host cancer survivors and their guests for a meal and activities during the 2018 Crucial Catch – Intercept Cancer event. The event is an invitation for cancer survivors and their families to enjoy an evening at Velocity Air recreational center. The J100 Men Tackling the Big C Prostate Cancer Awareness (MTBC) initiative works to enlighten at-risk men on prostate cancer prevention, diagnosis and treatment. As part of MTBC, the J100 invited eight survivor families (including other cancer) to the Crucial Catch event. J100 invited cancer survivors and their families include: Paul Tutwiler (J100 member), Dr. Leonard Love, Chelsea Hunt, Veronica Glover, and Monique Ellis. J100 members in attendance were Albert Chester, VP Development Ken Pinnix and President Charles Griggs. Also, special thank you to Jaguars linebacker Donald Payne (#52) for working with the J100 on cancer awareness. Payne will represent the J100 MTBC during the NFL My Cause My Cleats campaign. Visit this link to take the J100 MTBC Online Risk Assessment.